LOS ANGELES (KABC) — It’s tough enough for most of us to get around L.A., but imagine if you were confined to a wheelchair and forced to rely on public transportation. The L.A. County Metropolitan Transportation Authority (MTA) says safety is its first priority for the millions of bus and rail-car riders it serves every year. 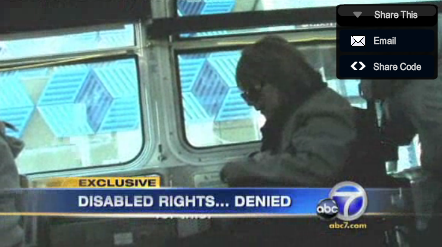 But disabled riders who spoke to ABC7 Eyewitness News tell a much different story. In a two-month undercover investigation, we attached hidden cameras to the wheelchairs of some of those riders. We found violations of federal civil rights law, and some drivers putting the lives of their passengers at risk.